Pan-fried falafel? 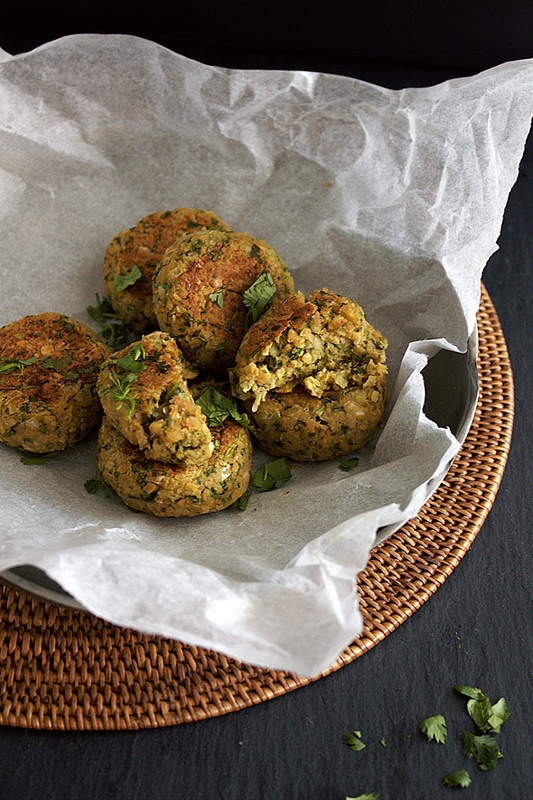 You know, falafel, but pan-fried! Fresh cilantro and an oriental-yet-familiar spice mix give this twist on the traditional Middle Eastern street food character and an irresistible aroma that let you forget the meat. 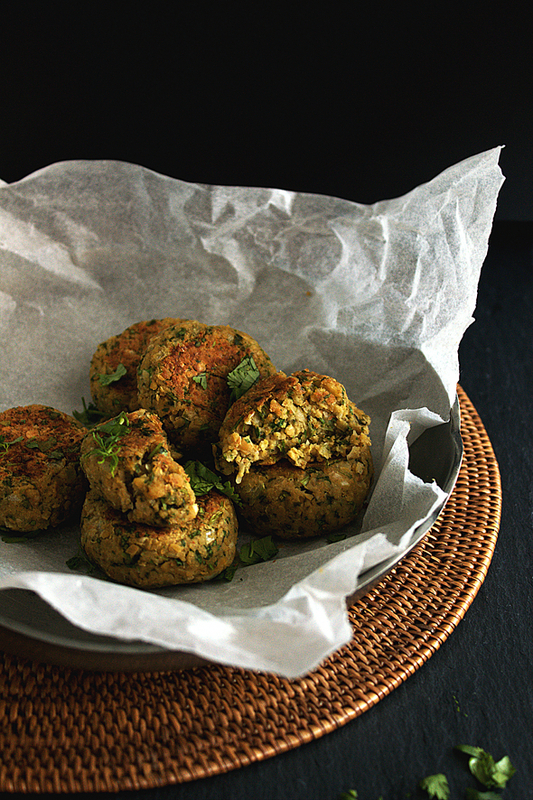 Falafel refers to the usually fried chickpea and herbs based balls themselves as well as falafel wrapped in flatbread together with salad and other sometimes pickled vegetables and a (tahini) sauce. This recipe introduces the patties themselves but new as a home cooking friendly pan-fried version. The first falafel (wrap) I tried was I believe at a music festival – one with no camping but still with very earthy and back-to-the-roots spirit. It was love at first bite. Between all the popular choices I usually went after like delicious Indian Pakora or Dinnele (a savory South-German bread dough specialty) this had the potential to become a new favorite. Spices like ground cumin, coriander and a touch of cinnamon together with fresh cilantro in reasonable amounts lend this dish its convincing oriental flavor and scent. Coconut oil underlines that and is not only health-wise a good choice (yes, natural saturated fats like in coconut oil or avocado aren’t bad at all – they are good for us). With slight modification and little precaution – keep calm and be gentle when flipping them – you can easily prepare falafel in a skillet. A roomier skillet will make it easier to flip them. 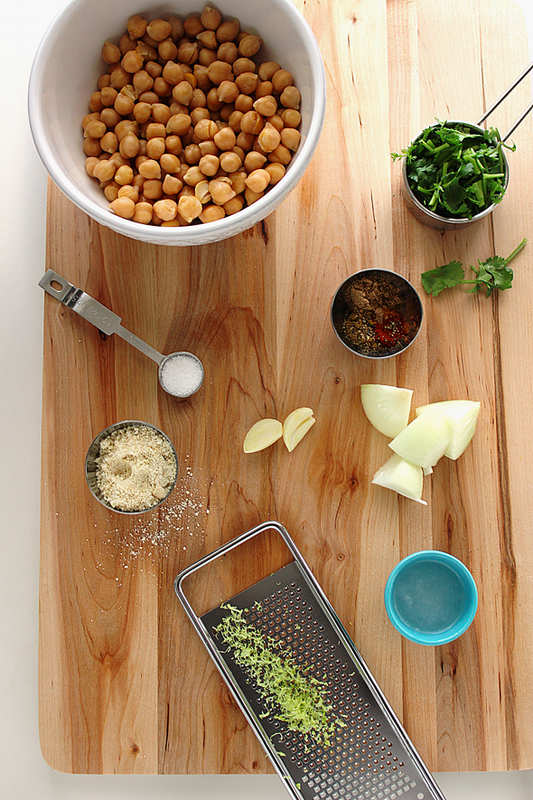 Another plus convenience-wise is that you can use canned chickpeas for this method. If you would deep-fry your falafel made from canned chickpeas they would almost mysteriously disappear in the frying oil (a YouTube video by the light-hearted Titli from Titlis Busy Kitchen shows what happens). Put all ingredients in a food processor and process till everything is mixed and a thick dough-like consistency forms. If the dough feels too wet, add some more ground cashews. Now scrape the chickpea dough with the help of a spatula out of the food processor and form a big ball. Flatten it and cut it in halves (and thirds) till you have either 6 or 8 pieces of about the same amount and you can form 6 or 8 patties out of them. Therefor simply roll each one of them into little balls and then you gently press them down. Meanwhile heat up a roomy pan on medium heat with 1 TS coconut oil. Spread the oil evenly. 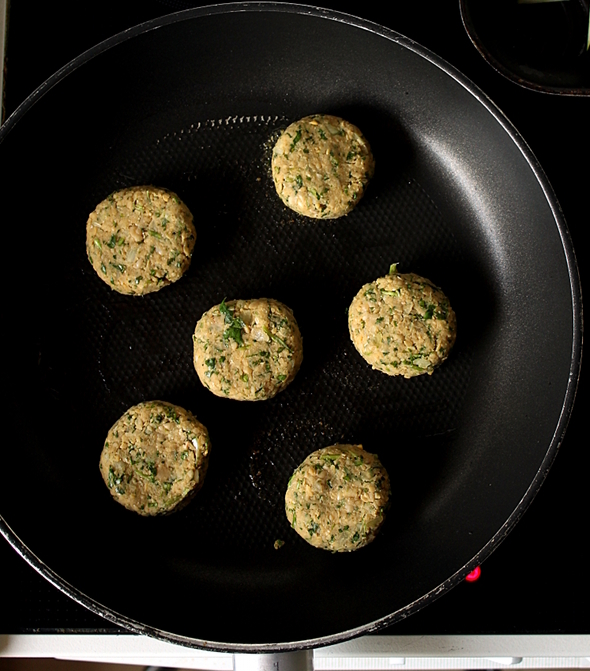 When the pan is hot enough place your chickpea patties in and fry them for 5-6 minutes on each side or until they are crispy and golden brown on the outside. This will make 8 small, 6 medium sized or 4 big patties. If in doubt, go with 6. 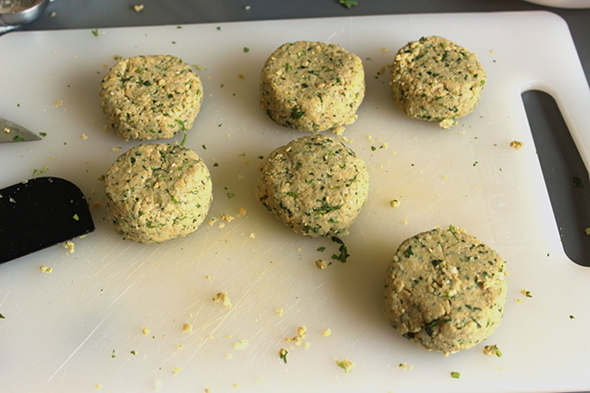 Be gentle when flipping, as the falafels are very delicate and could break easily. A roomier pan will make it easier to flip them. FYI: Falafel from canned chickpeas is not tough enough for deep-frying and will break apart in the oil.